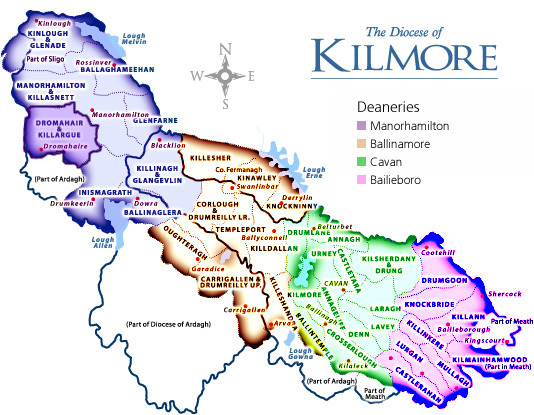 Welcome to the web site of the historic parish of Drumlease - Killargue, a parish of the Roman Catholic Diocese of Kilmore. The parish, situated in County Leitrim, Ireland, encompasses three church areas: St. Patrick's Church, Dromahair, St. Brigid's Church, Killargue, and the Church of Mary the Mother of God, Newtownmanor. The Parish Priest - Fr. Anthony Fagan, along with the Parish Pastoral Council extend a warm welcome to all who have moved into our parish in recent times and to all who visit this web site. We extend a special welcome to our emigrants and those who can trace their ancestry to this locality. Please feel free to visit our Links page for information on services which may be of interest to you. Enjoy your visit. Parish Data Privacy Statement. Please consult the Parish Newsletter each week for days and times of daily Masses in each church. Additional information is also available on the Ceremonies page of this web site. The telephone numbers of some of our neighbouring priests are published on the Directory page.